Get ready for some Fosse-level entertainment! 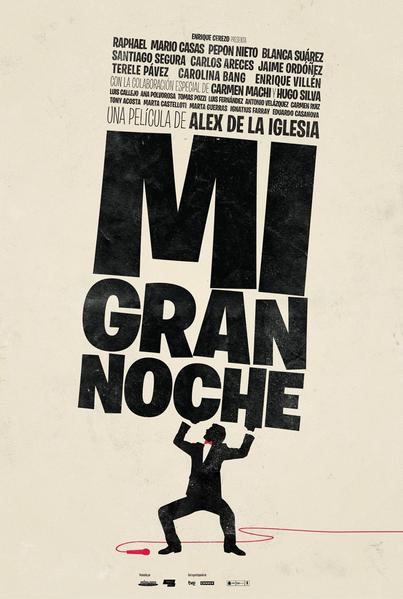 An audaciously inventive ensemble comedy brimming with showbiz satire, the latest from Spain's madcap maestro Álex de la Iglesia...is a hoot. Featuring a cavalcade of Iglesia regulars, My Great Night offers an all-access backstage pass to a TV variety show so full of hitches and snags its participants will be lucky if they survive the taping. There appears to be a big Bob Fosse-esque production number and at least one pro wrestler/pop dream-boat. So, you know, there could be witches, mutants and beasts. There is definitely a lovely poster. This is a really sweet poster. The trailer is similarly in Spanish. But even if you don't speak Spanish it's still plenty of fun.